Hannah is a 27-year-old three-time National Champion British sailor, currently campaigning on the Olympic sailing circuit in the Laser Radial (the Women’s Single-handed Olympic Class). She learned to sail at the Salterns Sailing Club in Lymington aged 8 in an Optimist, and progressed to competing on a National and International level in a Laser Radial as a member of the National Youth Squad. She was forced to take 2 years out from sailing as a result of contracting the Epstein Barr Virus and M.E. at the age of 16, taking a gap year after school to fully recover and resume her sailing career. Considerable success in the International summer events of 2009 culminated in her selection for the Skandia Team GBR Olympic Training Group. Despite missing most of her time in 6th form, Hannah received an unconditional offer from Gonville & Caius College, Cambridge, to read Natural Sciences. She completed her first year at Cambridge in June 2010 and then deferred for a year in order to train for and participate in the 2012 trials. In sailing there is only one spot for each country in each class of boat, so competition for Olympic places, particularly in Team GB, is fierce. Finishing 11th at the first Olympic Trial Event, a World Cup regatta in Weymouth in June 2011, was a huge achievement. However with 2 British girls in front, the Olympic Test Event spot went to the 1st GBR boat. Hannah made the decision to return to University, but the 2012 trials in the Laser Radial class were then extended to the Perth ISAF Sailing World Championships in December 2011, since the competition had been so close between the British boats. She returned from Perth placed 2nd British boat and 14th overall in the world (GBR podium funding minimum criteria for full time sailors was top 20 in the world). This earned her the prestigious Marlow Ropes Award for the standout achievement of a GBR Development Sailor. A successful 2012 saw Hannah win the GBR Laser Radial National Championships (the first lady ever to do so), continue training as part of the British Sailing Team in the build up to the Olympics, and work with the commentary team in the sailing spectator site during the Games. While continuing to train and compete on the sailing scene during her final year at University, Hannah managed to earn a First class Cambridge degree, including winning the John Reekie Memorial Prize for the best geology dissertation in the year. After finishing her degree in June 2013, Hannah threw herself into full time campaigning. She steadily worked her way up the World Rankings, achieving among other notable results, a 9th place at the 2013 Europeans, a bronze at the 2014 Copa Brasil del Vela in Rio, an 8th place at the 2014 Hyères World Cup regatta, and a 12th place at the inaugural World Cup Grand Final in November 2014 having been invited to compete in Abu Dhabi with the best top 20 sailors in the world in each Olympic class by the International Sailing Federation. As of October 2014, Hannah was number 1 on the UK National Ladder and 17th in the World Rankings. However, she received a knock in September 2014 when she lost her place in the British Sailing Team. It was a huge shock as the decision was made six days after she finished 16th at the Santander ISAF Sailing World Championships. 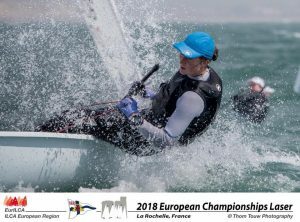 Hannah continued her full time sailing campaign without any national federation programme funding, coaching or support for another year, training partnering top sailors from other countries, and once again gaining a place among the top 20 to be invited to the ISAF Sailing World Cup Final. Due to financial constraints, she had to make the decision to take a break from sailing full time after that regatta. In the last two years as well she has done some sailing in other boats to learn different skills on the water, and has finished 7th and 4th as a crew in the RS500 World Championships in 2016 and 2017. Hannah now works part time as a journalist for the local paper, and as a freelance sailing coach, as well as songwriting and playing music in local venues! Jumping back in a Laser Radial with little to no training in 2017, she rocked up to the World and European Championships and finished 26th and 14th respectively. Having had so little time in the boat, she was buoyed by these results and the fact that she can still compete at the front of an international fleet of full timers. She recommenced her campaign with a month-long trip to Miami in January 2018 to train with the US Sailing Team and compete in the World Cup, and is now planning her programme comeback, while continuing to work her two jobs. The goal is to achieve a major international podium, and the ultimate dream is to bring an Olympic medal back home to Great Britain.